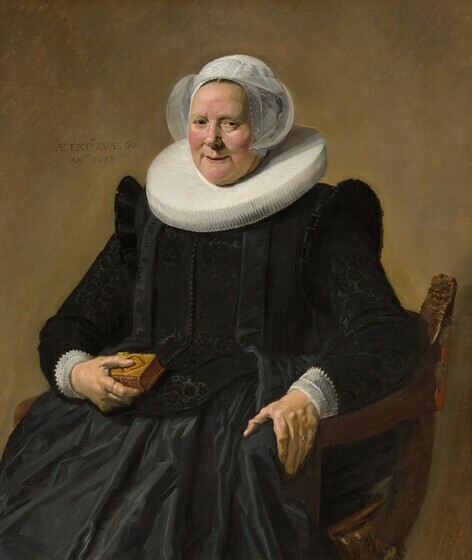 Arthur K. Wheelock Jr., “Frans Hals/Portrait of an Elderly Lady/1633,” Dutch Paintings of the Seventeenth Century, NGA Online Editions, https://purl.org/nga/collection/artobject/74 (accessed April 20, 2019). 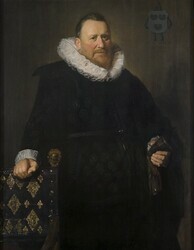 Although the name of the sitter in this impressive portrait is not known, Hals has inscribed her age, sixty, and the date of the painting, 1633, in the background on the left. The small Bible or prayer book she holds in her right hand and her conservative black costume with its white millstone ruff collar convey a pious nature, yet Hals reveals far more about her through her face and hands than through her costume or book. With broad strokes of the brush he captures her lively, robust personality. The woman’s self-confidence is expressed in the twinkle of her eyes, in the firm grasp of her hand on the arm of the chair, and in the strong silhouette of her form against the light gray background. This painting demonstrates the range in Hals’ brushwork for commissioned portraits of the early 1630s. At this stage of his career, projecting the three-dimensionality of the figure through strong modeling of the features was of primary importance. The form of the head is built up in planes of light that are accented with firm strokes in the highlights and shadows. The white lace cap and collar are carefully depicted, as the artist sought to project not only their detail but also their translucence. While he also articulated the design in the black jacket with great care, he indicated the folds of the skirt with comparatively free brushstrokes that suggest the flickering of light off its surface. Seymour Slive, ed., Frans Hals, 3 vols. (London, 1970–1974), 3: no. 78; 2: pl. 1240. but the differences between these paintings are as remarkable as their similarities. By intensifying his light in the Washington painting, Hals has accented the woman’s features and given her greater three-dimensional presence. He has augmented this effect by flattening the angle of her collar, shifting the position of her right hand so that it is turned more toward the viewer, and placing her in a low-backed chair to allow her form to be silhouetted against a light background. The result of these changes is that the personality of the woman in the Washington painting is projected in a remarkably forceful and direct manner. Seymour Slive, ed., Frans Hals (Washington, DC, 1989), 262, no. 45. The current tacking margins of Portrait of an Elderly Lady are covered with original paint. If they were flattened, the dimensions would be 105.6 by 89.4 centimeters. Three of the edges have been trimmed, leaving no unpainted margins. Since very little cusping of threads is visible along the edges, it seems probable that the image was still larger; its original size, however, cannot be determined. Recent technical study of the Frick painting suggests that the left edge has been reduced in addition to the reduction of the lower edge described in The Frick Collection: An Illustrated Catalogue—Paintings, American, British, Dutch, Flemish, and German. (New York, 1968), 1:209–210, no. 10.1.69 (see notes dated August 21, 2008, for the National Gallery of Art painting, and September 22, 2008, for the Frick painting in National Gallery of Art conservation department files). It is possible that the original format of these paintings approached that of the Haarlem ones, which are more vertical in shape. These remarks are based on examination of the two paintings (as in note 7 above) as well as analysis by the National Gallery of Art scientific research department using microscopic examination of cross-sections from both paintings (see notes dated August 21, 2008, for the National Gallery of Art painting, and September 22, 2008, for the Frick painting in National Gallery of Art conservation department files). No inscription appears on the Frick painting, and examination did not show evidence that an inscription has been effaced. In Hals’ companion portraits Lucas de Clercq and Feyna van Steenkiste, 1635 (Rijksmuseum, Amsterdam, inv. nos. c 556, c 557; see Seymour Slive, ed., Frans Hals, 3 vols. [London, 1970–1974], 3: nos. 104, 105), only the woman’s portrait bears a date. Jurriaans; (his sale, Van de Schley, Roos, and De Vries, Amsterdam, 28 August 1817, no. 20); Cornelius Sebille Roos [1754-1820], Amsterdam. Charlotte-Camille, Comtesse Boucher de la Rupelle [née de Tascher, d. 1911], Paris; sold by 1905 to (Charles Sedelmeyer, Paris); James Simon [1851-1932], Berlin, by 1906; (Abraham Preyer, The Hague); purchased 12 June 1919 by (Duveen Brothers, Inc., London, New York, and Paris); held jointly with (Thos. Agnew & Sons, Ltd., London), June to November 1919); (Duveen Brothers, Inc.); sold June 1920 to Andrew W. Mellon, Pittsburgh and Washington, D.C.; deeded 28 December 1934 to The A.W. Mellon Educational and Charitable Trust, Pittsburgh; gift 1937 to NGA. The name is also inscribed on copies of the 1817 sale catalogue as “Jurjans.” See the description of Sale Catalogue N-298 in The Getty Provenance Index Databases, J. Paul Getty Trust, Los Angeles. From The Hague on 4 May 1919, Preyer cabled fellow dealers Scott and Fowles in New York that he had purchased the painting; see Duveen Brothers Records, accession number 960015, Research Library, Getty Research Institute, Los Angeles: reel 229, box 374, folder 7. Duveen Brothers Records, accession number 960015, Research Library, Getty Research Institute, Los Angeles: reel 103, box 248, folder 22. Oddly, the Duveen prospectus, in NGA curatorial files, says the painting was acquired by Duveen in 1927, which is clearly an error. The painting was Agnew’s stock number J1821. This information comes from the Agnew stock books, and is recorded in the Public Collections portion of the Getty Provenance Index® Databases. J. Paul Getty Trust, Los Angeles. Catalogue of 100 Paintings by Old Masters, Sedelmeyer Gallery, Paris, 1905, no. 13. Ausstellung von Werken alter Kunst, Kaiser-Friedrich Museum, Berlin, 1906, no. 49. Masterpieces of Art. European Paintings and Sculpture from 1300-1800, New York World's Fair, 1939, no. 179. 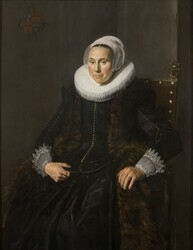 Frans Hals, National Gallery of Art, Washington, D.C.; Royal Academy of Arts, London; Frans Halsmuseum, Haarlem, 1989-1990, no. 45, color repro.as Portrait of a Seated Woman. The original support, a medium-weight, plain-weave fabric, has been lined with the original tacking margins trimmed. Part of the painting surface has been turned over all four stretcher edges to form a new tacking margin, reducing the height by at least 3 centimeters and the width by at least 2.5 centimeters (see text). The X-radiograph shows only faint cusping along the top and left edges. Above the book at the juncture of the dress and arm is a large repaired hole and adjacent vertical tear. During this treatment the painting was analyzed by the NGA Scientific Research department using microscopic examination of cross-sections (see notes dated August 21, 2008, in NGA Conservation department files). Hofstede de Groot, Cornelis. A Catalogue Raisonné of the Works of the Most Eminent Dutch Painters of the Seventeenth Century. 8 vols. Translated by Edward G. Hawke. London, 1907-1927: 3(1910):108, no. 371. Moes, Ernst Wilhelm. Frans Hals: sa vie et son oeuvre. Translated by J. de Bosschere. Brussels, 1909: 108, no. 186. Bode, Wilhelm von, and Moritz Julius Binder. Frans Hals: His Life and Work. 2 vols. Translated by Maurice W. Brockwell. Berlin, 1914: 1:43, no. 138, pl. 79. Bode, Wilhelm von, and Moritz Julius Binder. Frans Hals: Sein Leben und seine Werke. 2 vols. Berlin, 1914: 1:40, no. 138, pl. 79. Sedelmeyer, Charles. Hundred masterpieces. A selection from the pictures by old masters which form or have formed part of the Sedelmeyer Gallery. Paris, 1914: 30, no.13, repro. Valentiner, Wilhelm R. Frans Hals: des meisters Gemälde in 318 Abbildungen. Klassiker der Kunst in Gesamtausgaben 28. Stuttgart and Berlin, 1921: 313, 103, 109, repro. Valentiner, Wilhelm R. Frans Hals: des Meisters Gemälde in 322 Abbildungen. Klassiker der Kunst in Gesamtausgaben 28. 2nd ed. Stuttgart, Berlin, and Leipzig, 1923: 313, 109, repro. Dülberg, Franz. Frans Hals: Ein Leben und ein Werk. Stuttgart, 1930: 114. Valentiner, Wilhelm R. Frans Hals Paintings in America. Westport, Connecticut, 1936: no. 41, repro. McCall, George Henry. Masterpieces of art: Catalogue of European paintings and sculpture from 1300-1800. Edited by Wilhelm R. Valentiner. Exh. cat. New York World's Fair, New York, 1939: 86, no. 179. Duveen Brothers. Duveen Pictures in Public Collections of America. New York, 1941: no. 191, repro. Preliminary Catalogue of Paintings and Sculpture. National Gallery of Art, Washington, 1941: 94, no. 67. Trivas, Numa S. The Paintings of Frans Hals. London and New York, 1941: 39, no. 41, pl. 59. National Gallery of Art. Book of illustrations. 2nd ed. Washington, 1942: no. 67, repro. 25, 240. National Gallery of Art. Paintings and Sculpture from the Mellon Collection. Washington, 1949: 74, repro. Shapley, Fern Rusk. Comparisons in art: A Companion to the National Gallery of Art, Washington, D.C. London, 1957: pl. 101. Walker, John. National Gallery of Art, Washington, D.C. New York, 1963: 311, repro. National Gallery of Art. European Paintings and Sculpture, Illustrations. Washington, 1968: 57, repro. Slive, Seymour. Frans Hals. 3 vols. National Gallery of Art Kress Foundation Studies in the History of European Art. London, 1970–1974: 1(1970):115; 2(1970):pls. 135, 138; 3(1974):42, 50, no. 82. Grimm, Claus. Frans Hals: Entwicklung, Werkanalyse, Gesamtkatolog. Berlin, 1972: 90, 202, no. 60, 89, repro. Montagni, E.C. L’opera completa di Frans Hals. Classici dell’Arte. Milan, 1974: 97, no. 83, 96, pl. 31. National Gallery of Art. European paintings: An Illustrated Summary Catalogue. Washington, 1975: 168, repro. Walker, John. National Gallery of Art, Washington. New York, 1975: 268, no. 350, repro. Watson, Ross. The National Gallery of Art, Washington. New York, 1979: 68, pl. 53. Baard, H. P. Frans Hals. New York, 1981: 57, fig. 60. Walker, John. National Gallery of Art, Washington. Rev. ed. New York, 1984: 268, no. 344, color repro. Wheelock, Arthur K., Jr. Dutch Painting in the National Gallery of Art. Washington, D.C., 1984: 10, repro. National Gallery of Art. European Paintings: An Illustrated Catalogue. Washington, 1985: 196, repro. Sutton, Peter C. A Guide to Dutch Art in America. Grand Rapids and Kampen, 1986: 308. Slive, Seymour. Frans Hals. Exh. cat. National Gallery of Art, Washington; Royal Academy of Arts, London; Frans Halsmuseum, Haarlem. London, 1989: 262-263, no. 45, color repro. Grimm, Claus. Frans Hals: The Complete Work. Translated by Jürgen Riehle. New York, 1990: color repro. 168, 183, 279, no. 63. Kopper, Philip. America's National Gallery of Art: A Gift to the Nation. New York, 1991: 67. Crijns, Marianne, and Rieke van Leeuwen. Huidziekten in de Beeldende Kunst. Nieuwegein, 1992: 84, color repro. National Gallery of Art. National Gallery of Art, Washington. New York, 1992: 123, repro. Wheelock, Arthur K., Jr. Dutch Paintings of the Seventeenth Century. The Collections of the National Gallery of Art Systematic Catalogue. Washington, 1995: 69-72, color repro. 71. Southgate, M. Therese. The Art of JAMA II: Covers and Essays from The Journal of the American Medical Association. Chicago, 2001: 50-51, color repro. Weller, Dennis P. Jan Miense Molenaer: Painter of the Dutch Golden Age. Exh. cat. North Carolina Museum of Art, Raleigh; Indianapolis Museum of Art, Indianapolis; Currier Museum of Art, Manchester. Raleigh, 2002: 110-111, repro. Hand, John Oliver. National Gallery of Art: Master Paintings from the Collection. Washington and New York, 2004: 186-187, no. 146, color repro. Harris, Ann Sutherland. Seventeenth-century Art and Architecture. Upper Saddle River, New Jersey, 2005: 322, repro. Atkins, Christopher D.M. The Signature Style of Frans Hals: Painting, Subjectivity, and the Market in Early Modernity. Amsterdam, 2012: 226. Seymour Slive, ed., Frans Hals, 3 vols. (London, 1970–1974), 3: no. 78; 2: pl. 1240. Seymour Slive, ed., Frans Hals, 3 vols. (London, 1970–1974), 3: no. 77. Pendant portraits by Peter Paul Rubens of Peter van Hecke and Clara Fourment, c. 1630, with the man standing and the woman seated, are in the Mauritshuis, The Hague. See Ben Broos and Ariane van Suchtelen, Portraits in The Mauritshuis 1430–1790 (Zwolle, 2004), 239–243, nos. 53, 54. The Frick Collection: An Illustrated Catalogue—Paintings, American, British, Dutch, Flemish and German (New York, 1968), 1:209, no. 10.1.69; Seymour Slive, ed., Frans Hals, 3 vols. (London, 1970–1974), 3: no. 67. 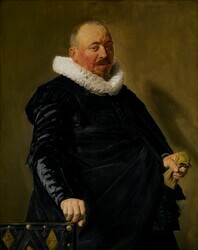 The possible relationship of these paintings was first proposed in Wilhelm R. Valentiner, Frans Hals: Des meisters Gemälde, Klassiker der Kunst in Gesamtausgaben, vol. 28 (Stuttgart and Berlin, 1921), 108; and Wilhelm R. Valentiner, Frans Hals Paintings in America (Westport, CT, 1936), no. 41; it was followed by Numa S. Trivas, The Paintings of Frans Hals (New York, 1941), 41. Seymour Slive, ed., Frans Hals, 3 vols. (London, 1970–1974), 3: no. 67. Claus Grimm, Frans Hals: The Complete Work, trans. Jürgen Riehle (New York, 1990), cat. 44, also dates the Frick painting to about 1628. Seymour Slive, ed., Frans Hals (Washington, DC, 1989), 262, no. 45. The current tacking margins of Portrait of an Elderly Lady are covered with original paint. If they were flattened, the dimensions would be 105.6 by 89.4 centimeters. Three of the edges have been trimmed, leaving no unpainted margins. Since very little cusping of threads is visible along the edges, it seems probable that the image was still larger; its original size, however, cannot be determined. Recent technical study of the Frick painting suggests that the left edge has been reduced in addition to the reduction of the lower edge described in The Frick Collection: An Illustrated Catalogue—Paintings, American, British, Dutch, Flemish, and German. (New York, 1968), 1:209–210, no. 10.1.69 (see notes dated August 21, 2008, for the National Gallery of Art painting, and September 22, 2008, for the Frick painting in National Gallery of Art conservation department files). Neil MacLaren, The Dutch School, 1600–1900 (London, 1960), no. 1251; Seymour Slive. Frans Hals, 3 vols. (London, 1970–1974), 3: no. 81.